Super stoked! I grew up with the Friday thte 13th movies, and Kane Hodder was definitely my favourite portrayal of Jason. 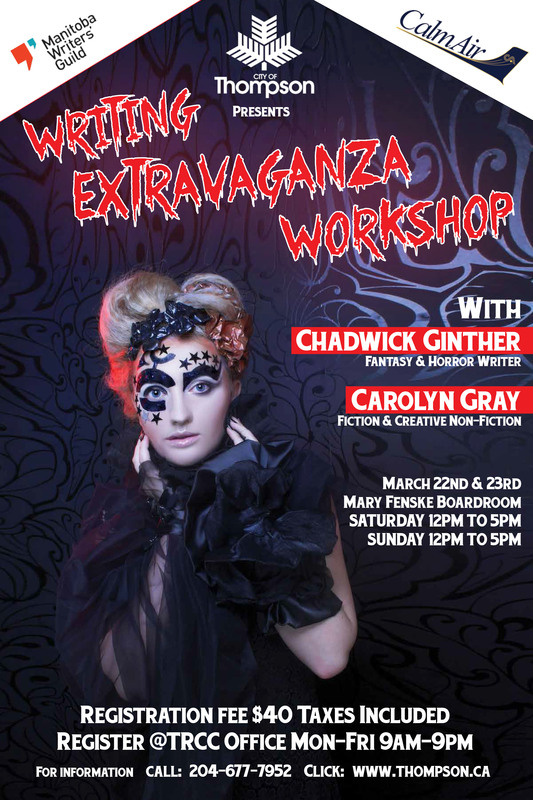 Huge thanks to the City of Thompson, The Manitoba Writers’ Guild and Calm Air for inviting me to present a fantasy and horror writing workshop, and for making this trip possible! It’s some auspicious timing also, what with the 22nd being the 20th anniversary of the first Hellboy comic! I’ll also be doing a reading and Q & A at the City of Thompson Public Library, Friday March 21st at 6pm. Thank you, Thompson Public for the invitation. 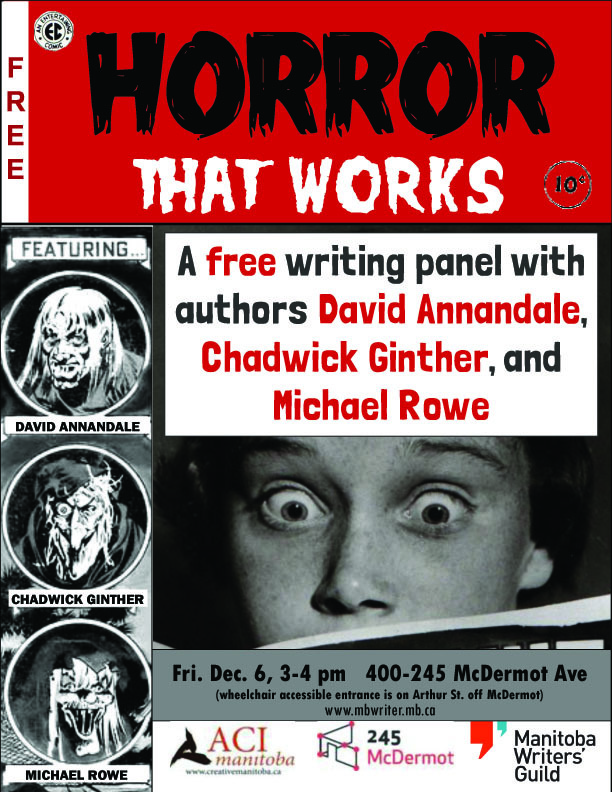 I am very excited to join these fine (and utterly horrific) fellows on Friday in a panel moderated by Maurice Mierau and sponsored by ACI Manitoba and the Manitoba Writers’ Guild! David Annandale is the author of Gethsemane Hall, The Death of Antagonis, and the Jen Blaylock thrillers (also published by Ravenstone Books). Michael Rowe is the Aurora and Sunburst Award nominated author of Enter, Night. He is in Winnipeg to launch his latest novel, Wild Fell. Then on Saturday I’ll be signing copies of Thunder Road and Tombstone Blues at McNally Robinson Booksellers from 2-4 pm. Hope to see you there! I just found out that a friend of a friend has a movie opening in Winnipeg tonight. Pretty cool stuff! Ferocious is Robert Cuffley’s third feature and was filmed on location in Saskatoon. Go Canadian indie film! Ferocious is about Leigh Parrish (Amanda Crew), a likeable, small-town girl, now famous actress, who takes increasingly drastic steps to protect her fame. Michael Eklund plays Eric, a bartender and former boyfriend of the long-gone celebrity. Kim Coates plays Maurice, the sleazy nightclub owner that has been extorting cash from the rising celebrity over an unsavoury secret Leigh is determined to bury forever. Ferocious opens in theatres in Winnipeg Friday March 15th at the Landmark Cinema 8 Theatre (301 Notre Dame Ave). My previous recommended reading post featured all Canadian authors, but I did read a bit outside of my nation in 2012. In the spirit of fairness, here is some work I really enjoyed by American and U.K. writers. Greatshadow, James Maxey. Solaris Books, January 2012.